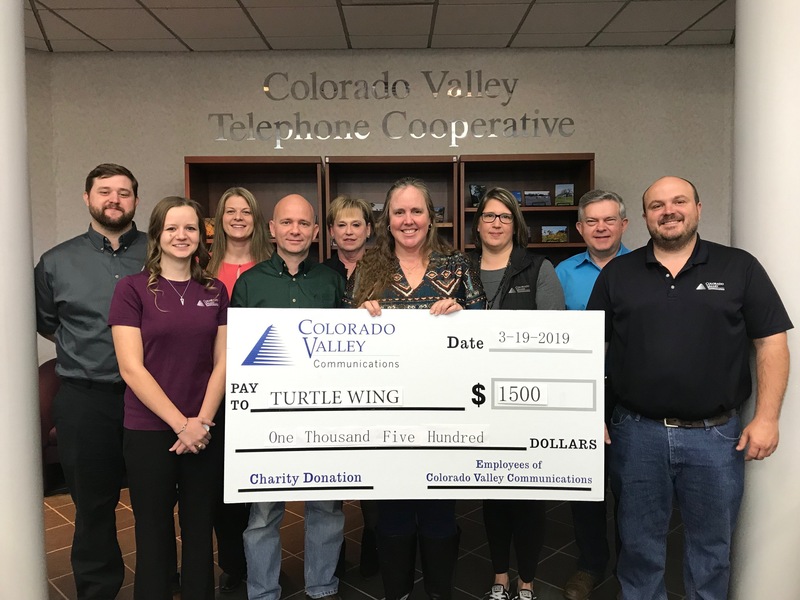 Turtle Wing was the recipient of a $1,500 donation made by the employees of Colorado Valley Communications on March 19, 2019. The donation was made through the Colorado Valley Communications Charity Fund, which is made up of voluntary payroll contributions used solely to support local charities. Turtle Wing’s Managing Director, Susie Shank accepted the donation. 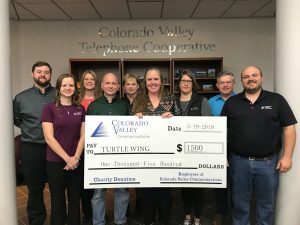 Colorado Valley Communications supports Turtle Wing’s mission to help children with learning challenges in rural areas achieve their full potential. 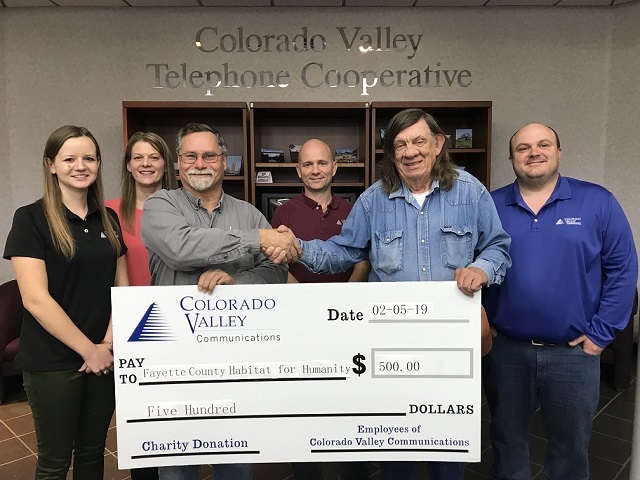 Fayette County Habitat for Humanity was the recipient of a $500 donation made by the employees of Colorado Valley Communications on February 5, 2019. 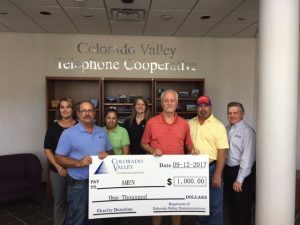 The donation was made through the Colorado Valley Communications Charity Fund, which consists of voluntary payroll contributions used solely to support local charities. Leonard Leffler, President of the Board of Directors at Fayette County Habitat for Humanity, accepted the donation in honor of Carl Miller for his participation at Colorado Valley’s Christmas party. Colorado Valley Communications supports Habitat for Humanity in their mission to bring people together to build homes, communities and hope. The Colorado Valley Communications Employee Charity Committee is proud to back the blue and do what we can to support the Fayette County Deputy CJ Lehmann Benevolent Fund. Thanks to the employees of Colorado Valley Communications, we were able to donate to Fayette County Deputy CJ Lehmann, who was shot in the line of duty on 11/01/2018. Donations for Deputy CJ Lehmann may be made online through PayPal at paypal.me/FCSMBS or in person or by mail at the Fayette County Sheriff’s Office C/O FCSMBS, at 1646 N Jefferson St. La Grange, TX 78945. In the memo portion, please write “For CJ”. 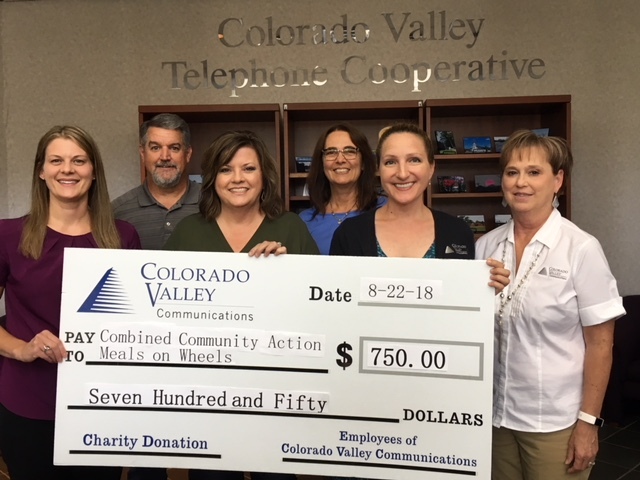 On August 22, 2018, the employees of Colorado Valley Communications donated $750 to Combined Community Action. Their mission is to assist people to become independent and self-sufficient by transitioning people out of poverty and providing comprehensive programs that support families and individuals. 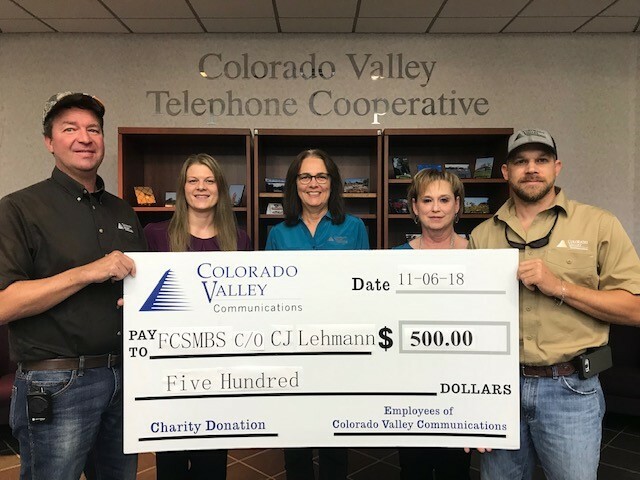 The donation was made through the Colorado Valley Communications Charity Fund, which is made up of voluntary payroll contributions used solely to support local charities. 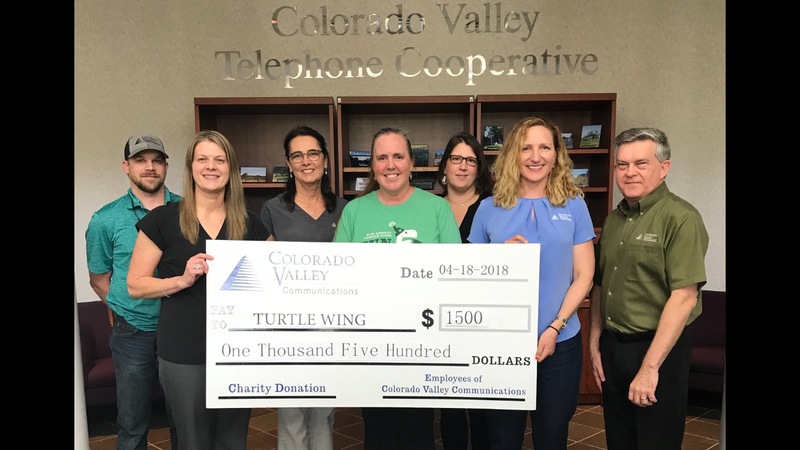 On April 19, 2018, the employees of Colorado Valley Communications donated $1,500 to Turtle Wing, which is an organization that helps families who have a child with a learning challenge. Turtle Wing primarily serves families in Fayette, Lavaca and Colorado counties and was founded in memory of Jackson Allen Hooper, who was diagnosed with high-functioning Autism. The donation was made through the Colorado Valley Communications Charity Fund, which is made up of voluntary payroll contributions used solely to support local charities. Gardenia E. Janssen Animal Shelter was the recipient of a $200 donation made by the employees of Colorado Valley Communications on February 7th, 2018. 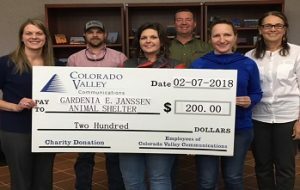 The donation was made through the Colorado Valley Communications Charity Fund, which is made up of voluntary payroll contributions used solely to support local charities. The donation was made in honor of Carl Miller. Mr. Miller volunteers his time during the holiday season to play the role of Santa at our Christmas party. Niki Powell, Executive Director of the Gardenia E. Janssen Animal Shelter, accepted the donation. 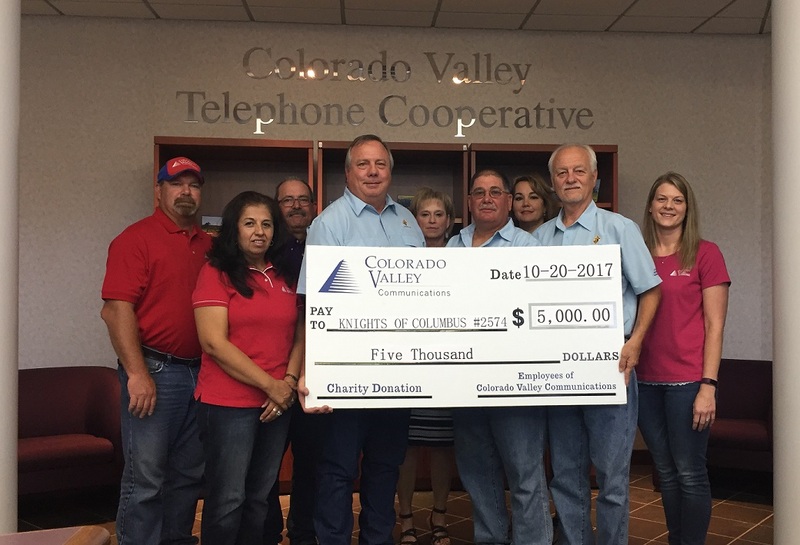 The employees of Colorado Valley Communications made a $5,000 donation on October 20, 2017 to the Knight of Columbus #2574. The donation was made to the Fayette Savings Bank “Neighbors Helping Neighbors Rebuilding Fund” and the amount will be matched by Fayette Savings Bank to provide $10,000 to the rebuilding fund. The donation was made through the Colorado Valley Communication Charity Fund, which is made up of voluntary payroll contributions used solely to support local charities. The Knights of Columbus Community Center Board President – David Goerig, Deputy Grand Knight – Charles Youngblood, and Treasurer – Garry Schellberg were present to accept the donation. 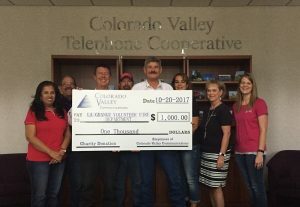 Colorado Valley Communications realizes the importance of the hall to our community and wants to help them in the rebuilding efforts. The La Grange Volunteer Fire Department was the recipient of a $1,000 donation made by the employees of Colorado Valley Communications on October 20, 2017. The donation was made through the Colorado Valley Communication Charity Fund, which is made up of voluntary payroll contributions used solely to support local charities. Fire Chief Frank Menefee and Assistant Chief Frankie Srubar accepted the donation. Colorado Valley Communications wants to support our local volunteer fire departments and appreciate what they do to protect our families and property. We realize the importance of their work in our community not only fighting fires but handling emergency situations such as hurricane recovery. The Boys and Girls Club of Champion Valley was the recipient of a $750 donation made by the employees of Colorado Valley Communications on September 18, 2017. The donation was made through the Colorado Valley Communication Charity Fund, which is made up of voluntary payroll contributions used solely to support local charities. Mariette Bellamy, Vice-Chair of the Board of Directors and Vickie Reeves, Resource Development and Community Relations Coordinator accepted the donation for the Club. 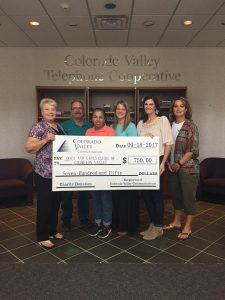 Colorado Valley Communications wants to support them in their mission to help youth reach their full potential as productive, caring, and responsible citizens. AMEN was the recipient of a $1,000 donation made by the employees of Colorado Valley Communications on September 12, 2017. 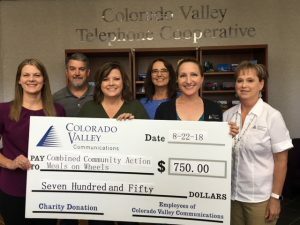 The donation was made through the Colorado Valley Communication Charity Fund, which is made up of voluntary payroll contributions used solely to support local charities. AMEN’s treasurer, Garry Schellberg accepted the donation. Colorado Valley Communications wants to support AMEN’s mission to fight hunger in our local community. We realize the importance of their work in our community, especially now after the devastation of Hurricane Harvey.